Posted December 13, 2015 by Heather Michet & filed under Crow Living, Food As Medicine, Health Tips, Medicinal Plants, Plant Talk. My favorite medicinal herb is Stinging Nettle (Urtica dioica). * It has many uses for health and wellness. and loves to impart its versatility as a recipe ingredient in the kitchen! Earliest uses – Bronze Age – of the plant were for cloth. It was common again during WWI when the Germans were stretching their cotton supply. The leaves are so high in chlorophyll that the Brits used it to make green dye for WWII camo paint. It is believed that the plant was brought to the U.S. intentionally because of its medicinal importance. There are approximately 45 nettle species worldwide. Prefers shady areas and disturbed soil; a nitrogen-giver like alder & scotch broom. They thrive in areas with abundant rainfall. Dies back to dried stalk in late fall, then begins springing up in early spring. Flowers are at the very crown of the stalk & topmost leaf pair; they are very tiny white blooms. Planted amidst other herbs as a companion plant it stimulates plant growth and increases essential oils content. 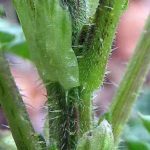 Small, hollow hairs , or ‘needles’, on the stems & underside of the leaves are filled with formic acid which causes the stinging action. The plant’s name comes from the Anglo-Saxon word for ‘needle’. 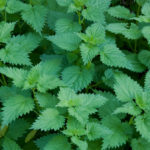 Nettle’s own juice and that of mullein, will act as an antidote to a nettle sting. The medicinal value lies primarily in the leaves; roots are used but less frequently. Blood purifier & builder. Also staunches blood flow, i.e. a nosebleed and internal bleeding. Rich in: iron, silicon, potassium, phosphorous, protein, calcium & alkaloids which neutralize uric acid therefore making it a great aid for rheumatism. Also contains potent levels of Vits A, C & D.
Nerve tonic: very helpful when kicking tobacco addiction. Use like spinach in soups, sautés, stir-fries or casseroles. Infuse leaves in boiling water for 10 minutes and drink as a tea. No matter how you use this wonderful plant, you will be blessed by at least one of its gifts. *SAFETY: The freeze-dried form is contraindicated for pregnancy.